Five days in, after another 4-hour stretch of walking over mountains on dusty roads with the occasional truck roaring past, I gave up. Having not accounted for how developed parts of Crete are and with a map unsuitable to planning an off-trail crossing of this southernmost island of Europe, I find myself facing failure before walking even 1/5th of the way across the island. 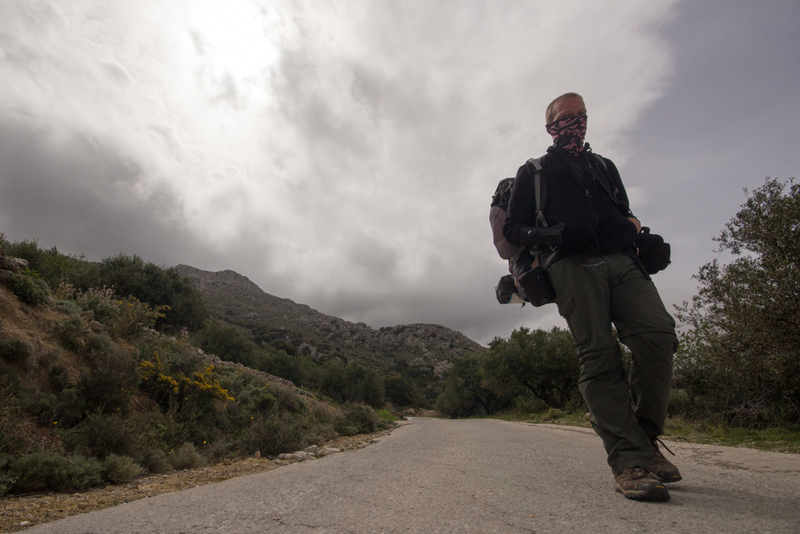 The author hiking on the roads of eastern Crete. The route planning and maintenance within each country is delegated to local hiking clubs, and in Crete this route unfortunately entails a lot of miles on pavement. 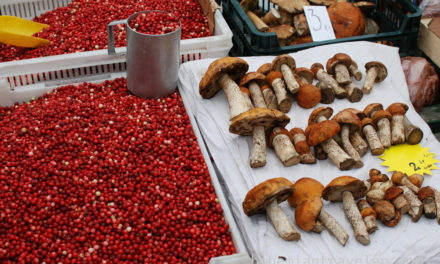 The island is full of landscapes of great beauty, though, and there’s no reason why your hike should be unsuccessful. Here’s how to approach the Crete E4. The E4 European long distance path was planned as a way for walkers to cross the entire continent on foot through some of its most interesting landscapes, and in Greece the trail stretches through the Peloponnese and hops a ferry to Crete before leaving off at the beach town of Kato Zakros and heading into the sea towards Cyprus. E4 signpost in the Kalikratis Gorge. Starting in Kato Zakros, on the eastern coast of Crete, I set myself up for lots of highway miles at the very beginning on the trek. Though you won’t necessarily avoid these stretches by starting at the more common western stretch, you will find the trail much easier to follow and save the road marches till the end when your feet are more accustomed to Crete’s rough terrain. Most of the trail markers seem designed to lead hikers coming from this direction, so you may also find yourself on fewer off-trail adventures than I put in at the start. Sweetwater beach, an hour east of Loutro. At two separate points (Sougia and Fragokastello), the E4 splits off into two distinct paths. 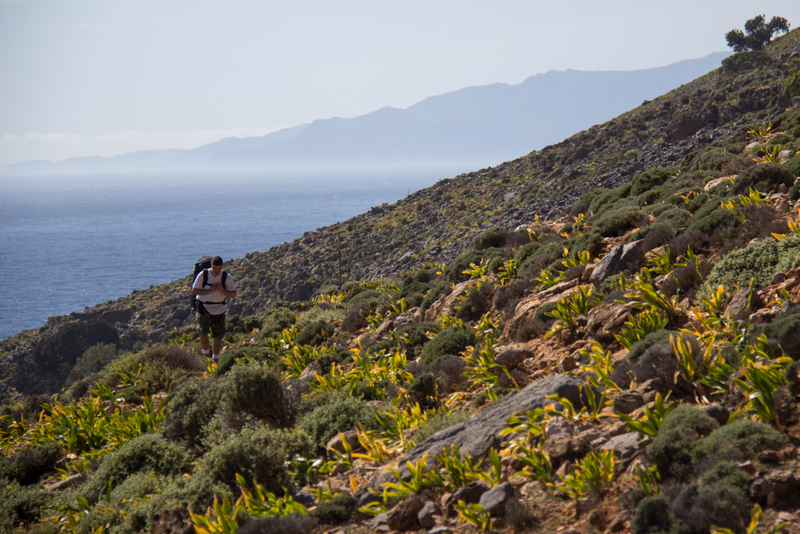 If the three-week through-hike isn’t appealing, these can make good loop trails to see a good mix of Crete’s landscapes. If you’re planning to hike the full length of Crete, though, you must decide between these mountain/coastal route choices. Dodging snowdrifts on the approach into the White Mountains. Though tourist stereotypes typically see Greece as a land of beaches and sunshine, the mountains of Crete get quite a lot of snow in wintertime. In the middle of April, for example, trails up into the White Mountains were still under enough snow cover to make the path impractical without legit winter gear. 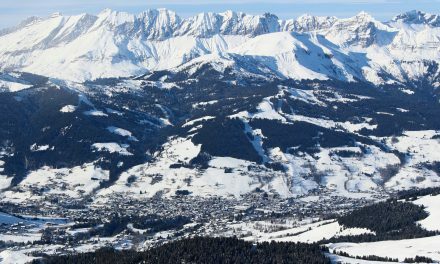 Aside from considerations of weather, choosing the way also demands an answer to what kinds of landscapes most appeal to your sense of adventure. Would you rather sleep in a cave on the seashore or in a snow-fringed valley high in the mountains? Once you’ve decided what part of the island you’d rather experience, get out a detailed map and start planning. 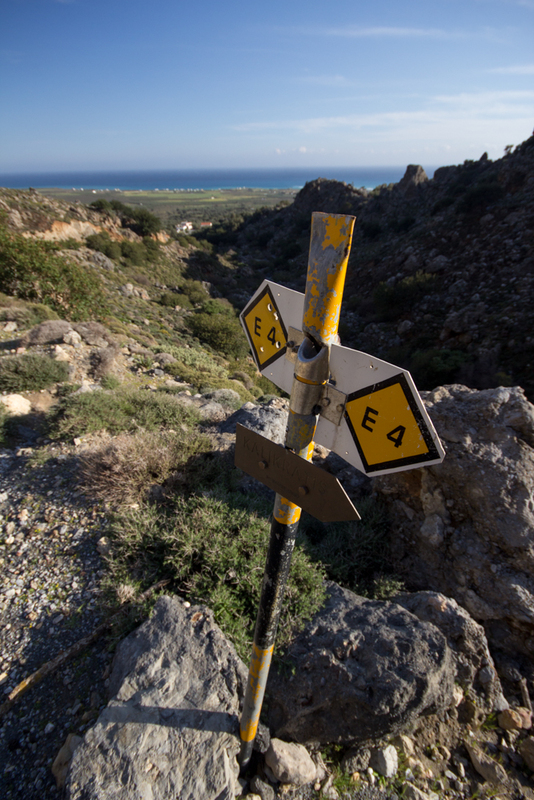 Hiking on the coastal route of the Crete E4 trail. Though the entire island (even those parts I saw from the road!) is quite beautiful, certain moments stand out as obvious high points of the hike. 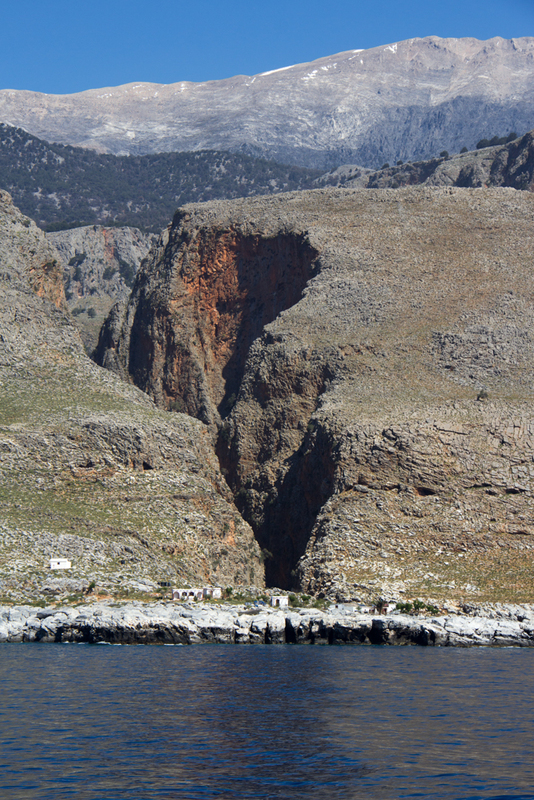 Crete is known for its gorges, and for good reason. Though Samaria Gorge is widely touted as the most beautiful canyon in Crete, I found Kalikratis and Tripti to be equally spectacular hiking though perhaps not quite so sheerly cut from the surrounding mountains. 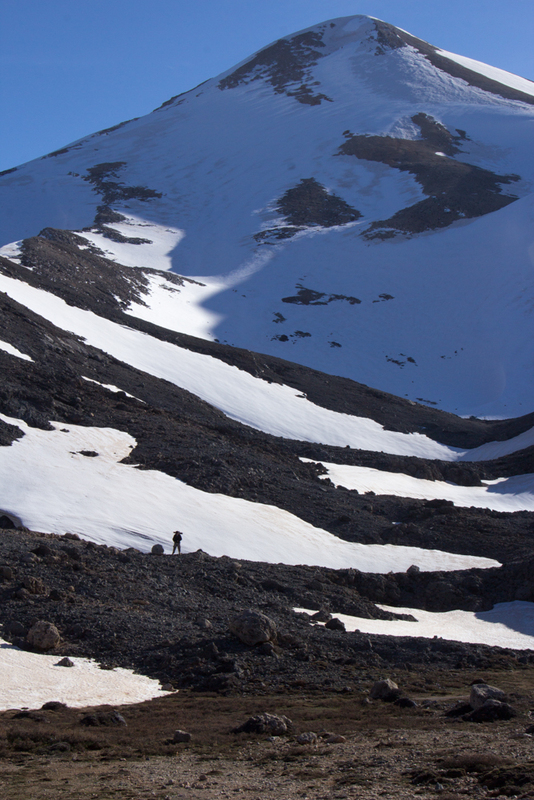 The name White Mountains is generally thought to refer to the stones of which Crete’s highest range is built, but during my visit could just have easily referred to the snow cover that piled high over the paths. Whether buried or bared, though, the trails into these mountains pass through desolate and empty hillsides where the small stone huts of shepherds and high peaks overhead are often the only landmarks. Water can be scarce here in summer and the trip takes deliberate preparation, but the payoffs for the feeling of being enveloped by mountains and then reaching a crest to panoramic views of the Libyan and Mediterranean Seas should make the effort totally worthwhile. In addition to overwhelming landscapes, Crete was also home to one of Europe’s oldest advanced civilizations and a number of invading conquerors over the centuries. Archaeological remnants dot the countryside, and while palaces at Knossos and fortified harbors in China are far more accessible the feeling of ruin and desolation at the abandoned town of Lissos or hilltop fortresses along the coast are far more evocative of the history the island has seen. 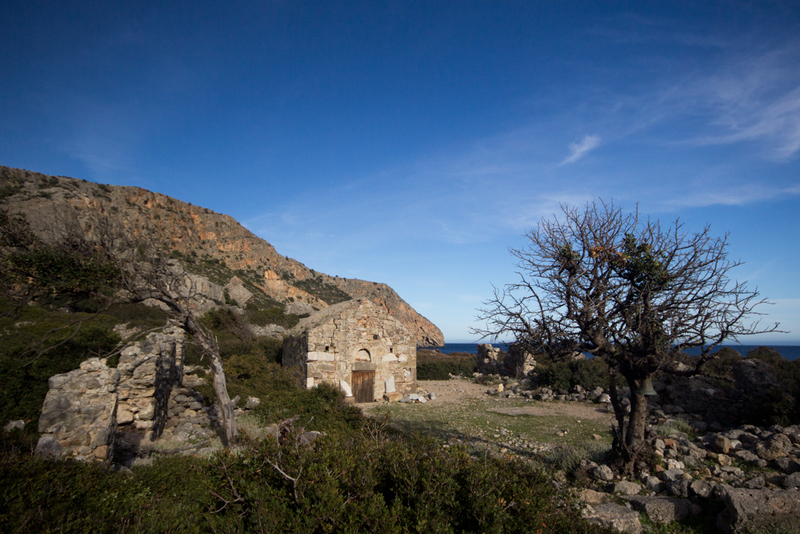 The reconstructed chapel of Agios Kirikos in the ruined city of Lissos. Though free camping is technically illegal in Greece, this was never enforced and indeed most people I asked were quite welcoming to a hiker setting up a tent for a night or two. 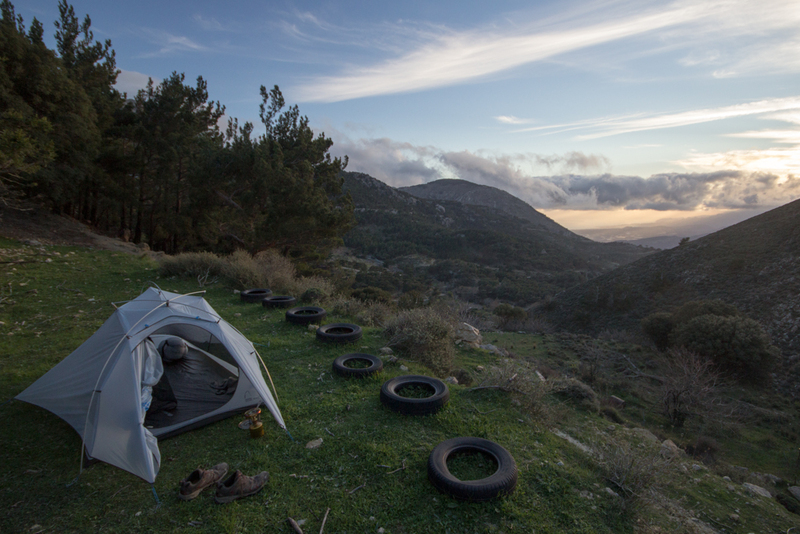 In the less developed corners of Crete it was rarely a problem to find a great spot to sleep, though in more settled areas I often found myself pitching camp in a neglected orchard as the sun went down. Making camp on a hillside above the Thriptis Gorge. 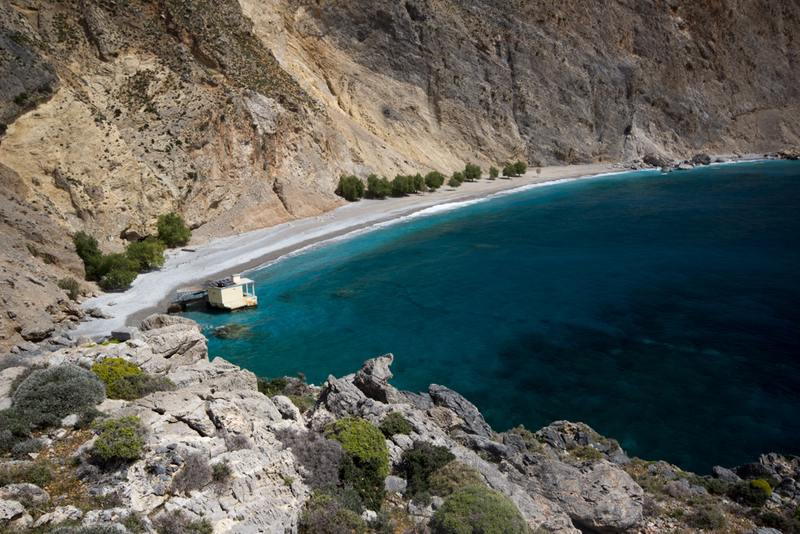 Just outside of the village of Agia Roumeli is perhaps the world’s best campsite. Along a small river and fronting the sea, these shady spots seem to be a favorite of hikers and nudists (and presumably nudist hikers?) resting for a few days or exploring the Samaria Gorge just north of the village. 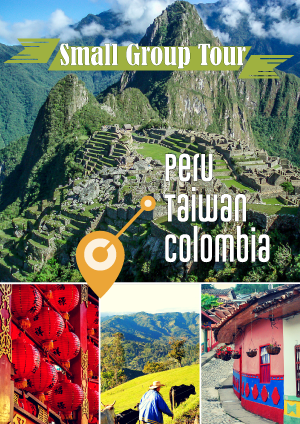 After arriving on the coastal route from Paleochora or through the White Mountains via the trail down Samaria, this is a great place to relax and enjoy good food or cold beer before continuing on. 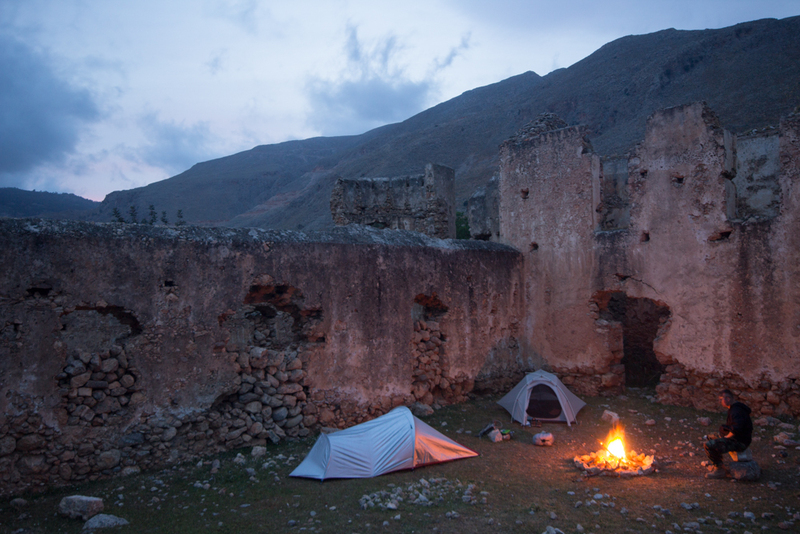 The ancient Venetian and Ottoman fortresses along the E4 were originally constructed for their grand views and convenient resting places, which of course makes them great campsites as well! The fortress above Loutro gets some visitors during the day, but at night makes a great spot to lie by a campfire and watch the stars above or the distant lights of Gavdos Island to the south. East of Sougia, just before the descent to Cape Tripti, another Ottoman relic offers a hilltop retreat looking out towards the sea or inland to the Tripiti Gorge. Camping above Loutro in an Ottoman fortress. Just beyond Tripti Gorge is a different kind of shelter, caves cut out from the coastline into the sides of the cliffs. Where once British submarines would have landed to ferry supplies to WWII resistance fighters, now only bats and the occasional stranded hiker sleep. Though sleeping out here is perhaps not the most comfortable way to pass a night in Crete, it does offer starlight skies almost completely undisturbed by light pollution from the island’s villages. Hiking in Crete, of course, doesn’t demand a full walk from coast to coast. Many of the villages along the southern coast, particularly on the southwest of the island, would serve as excellent bases for three or more days of short hikes. Marmara Bay and the Aradhin Gorge, an easy dayhike from Loutro or Likos. While walking on the full E4 will inevitably mean some time spent on roadways, intrepid hikers with a detailed map could plot an off-trail route around these obstacles. Barring that, traffic was usually common enough that hitchhiking would be possible on all but the most out-of-the-way tracks. In smaller villages, hikers and tourists are uncommon enough that it isn’t terribly unusual to be offered water and fruit and a bit of raki (the locally-made liquor). 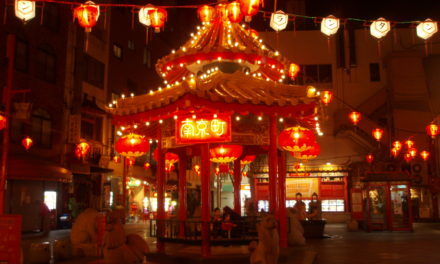 In larger or more touristy areas these spontaneous offers may be less common, but almost every restaurant meal will end with a couple of shots to send you merrily on your way. Really nice write up. I’ve visited Crete for years and only recently begun thinking about walking the E4. Super helpful post! Thanks Tim, glad you enjoyed it! 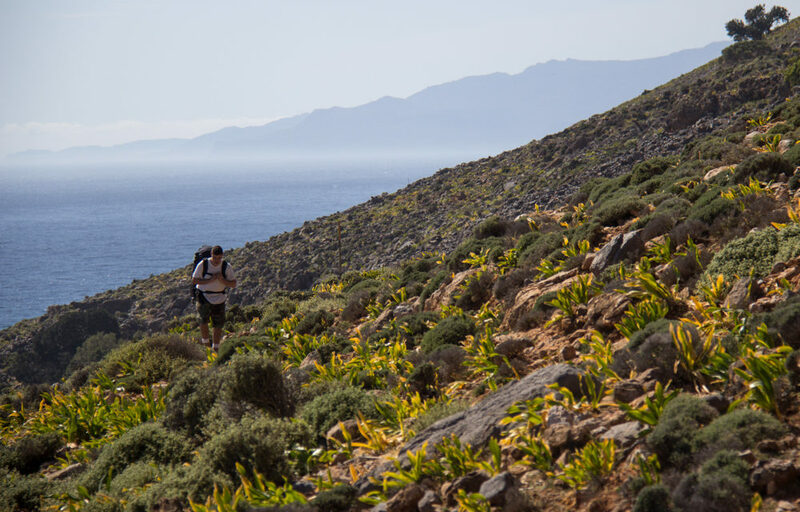 As much as the idea of a cross-island hike on Crete sounds great, I can tell you that the south-west network of footpaths is by far the best area to focus your time and efforts on. I first explored this area in 1987 and have returned 6 times. 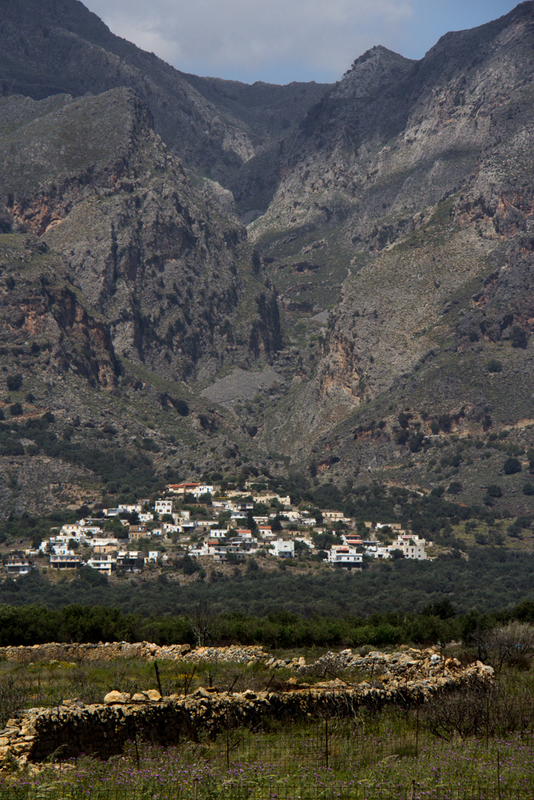 Also, the island of Gavdos (25 miles south of Crete, accessible by small ferry from Sfakia or other villages on the SW coast) offers fabulous hiking paths and the best free camping in the whole country. I agree entirely, William. I got to the island all excited about the cross-island hike, and quickly gave up the idea of that in preference for that SW corner. I did not, however, make it to Gavdos because the ferry timings didn’t line up very well with when I was in that area – it’s definitely a priority if I make it back down to Crete for any serious time.